Anyone 9 through 14 years of age. Players, in conformity will be assigned to special instructional and practice groups according to their age, ability and position. The HALL OF FAME HIGH SCHOOL GIRLS VOLLEYBALL CAMP will take place July 14 through the 16, from 9 a.m. to 12 p.m. each day at the John Kirchenbauer Athletic Complex (HHS Gym). Click here to apply. Dates for other 2009 academies are pending. When is the Academy Session? What Equipment and Clothing is required? Each player is responsible for supplying personal equipment consisting of: Shoes, glove, bat, supporter and jeans or wash pants. Official ACADEMY T-SHIRTS will be provided upon registration. What Does the Academy Feature? The Academy’s goat is to give immediate skill improvement and also to motivate and prepare the player for the approaching season with comprehensive background of: Expert instruction in fundamentals, innovative drills, personalized coaching, daily game experience and ‘in depth’ practice. SPECIAL GUEST INSTRUCTORS will give mini-clinics. A certificate of graduation will be accompanies by an instructional Baseball Handbook which includes a Player Profile Evaluation of Basic Skills. Along with the ACADEMY T-SHIRTS, color team photos will be provided and individual awards will be given to the various age groups, as well as contest winners. Special daily awards are given to the ‘Hustler of the Day’ and ‘Hall of Fame Player’ of the day. The academy will provide a free drink daily at the snack bar during break time and hot dogs and drinks on graduation day. Parents are urged to attend. Fee for the entire session of the Hall of Fame Academy is $20 for 3-day camp and $30 for 4-day camp including ACADEMY T-SHIRT, instructional handbook, color photo, player profile, and graduation certificate. All participants will be insured against any accident while attending the ACADEMY. A $15 deposit is required with each application, which assures the player a place in the Academy, and therefore is not refundable. Balance of the fee is payable at the beginning of the session. Representative of 30 years of combined head coaching experience on the high school and Division 1 University level college baseball. Produce CIF and WCAC championship teams and has been named ‘Coach of the Year’ on both levels. In 15 years of coaching baseball, had nine of his players accorded All-District Eight honors and four have been chosen to All-American teams. Some 40 of his former players have signed contracts to play professional baseball representing all levels of play, including the major leagues. 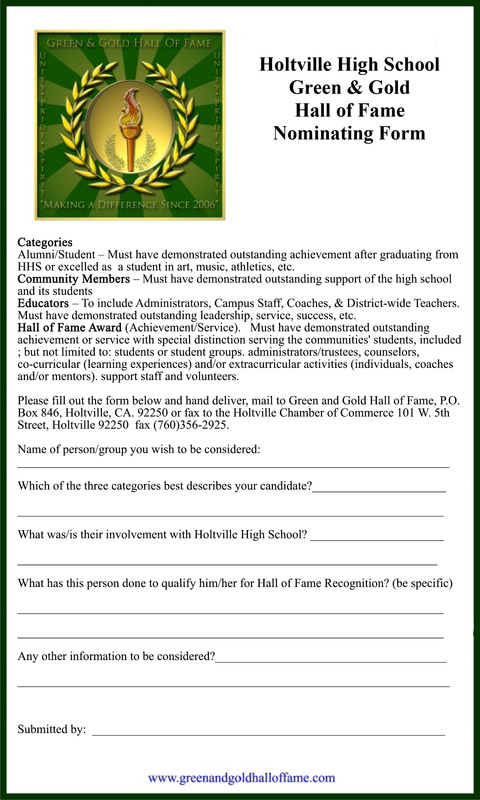 Holtville High School Hall of Fame member. Attended Holtville schools and graduated Holtville H. S. Attended I.V.C. where he was a two time All State Player and MVP for the league. Named a two time All Conference 2nd baseman at Azusa Pacific and two time NAIA College All American. Signed with the Seattle Mariners in 1980. Former Imperial High School baseball star, All-Imperial Valley League, All-CIF first-team honors and full-ride scholarship at Yavapai College. The Roughriders were the 2007 NJCAA Champions. Director of the Hall of Fame Volleyball Academy. Head Volleyball coach at Holtville High School.